In the seventeenth century, the founder of the Mother Dzogchen Monastery, His Holiness Dzogchen Padma Rigdzin (1625-1697), went to the Holy Rudam Canyon in Kham, eastern Tibet, with his three main disciples: Terchen Nyima Drakpa, who was like the sun; Ponlop Namkha Osel, who was like the moon; and Rabjam Thenpai Gyaltsen, who was like the stars. H.H. 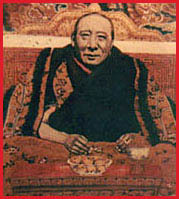 the Fifth Dalai Lama prophesied that Padma Rigdzin's activity in the eastern region would greatly further Dharma propagation in Tibet. Padma Rigdzin practiced for a long period of time in the Holy Rudam Canyon and Siltrom Snow Mountains, where he had many visions of Padmasambhava who instructed him to build a monastery. Later he and his disciples built the monastery, including a temple large enough for more than 3,000 lamas, which became one of the largest temples in Tibet. Padma Rigdzin and his disciples taught the Dzogchen Khandro Nyingthig for many years. Thousands of Tibetans came to the Holy Rudam Canyon to receive teachings and practice Dzogchen. More than sixty-four of Padma Rigdzin's disciples in this area attained Rainbow Body. 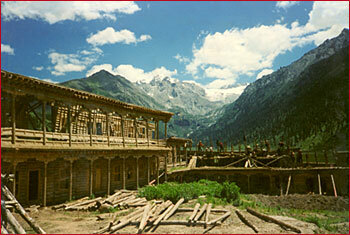 Because of this, the Rudam Canyon area came to be known as the Holy Dzogchen Area. The monastery, Rudam Orgyen Samten Choling, became known as the Mother Dzogchen Monastery. Many generations of the Dzogchen Rudam Orgyen Samten Choling Monastery's Vajra masters continued to care for and preserve the Dzogchen lineage, to the benefit of many sentient beings. Thousands of practitioners attained enlightenment. The Mother Dzogchen Monastery became the center for the development of the Vajrayana Buddhist tradition in Tibet. Gradually, the Dzogchen Monastery grew to include seven hundred branch monasteries with tens of thousands of lamas and millions of followers throughout Asia. The Dzogchen Monastery continued to flourish until 1959. The Dzogchen Monastery system is comprised of the Mother Dzogchen Monastery, the Dzogchen Shri Singha Five Sciences University, Dzogchen Meditation Retreat Centers, and the Holy Dzogchen Natural Mountain Caves. The Mother Dzogchen Monastery is one of the largest and oldest Nyingma monasteries in Tibet. In general, the Mother Dzogchen Monastery and all branch Dzogchen monasteries, are cared for by the Vajra masters. 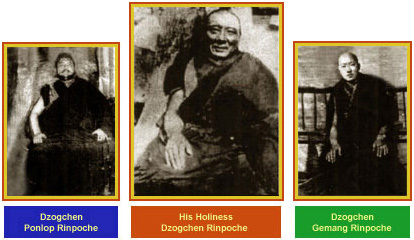 These include His Holiness Dzogchen Rinpoche, Dzogchen Ponlop Rinpoche, and Dzogchen Gemang Rinpoche. The Dzogchen monastic system only follows the directions of authentic Dzogchen masters who have attained enlightenment or high Dzogchen realization; political, monetary, cultural, or traditional forces have no influence on the Dzogchen monastery. The Dzogchen Monastery has more than one hundred Rinpoches and Khenpos, with 1,700 lamas serving in seven hundred branch Dzogchen monasteries in Asia. The branch Dzogchen monasteries are completely supported by the Mother Dzogchen Monastery. Five years of basic linguistic training is required for every young lama, including spelling, grammar, writing, and especially the memorization of Dharma texts. After this, the young lamas may receive monk's vows. Two years of training in tantric Dharma dances; graduates are known as Champon (choreography master). Three years of training in Dharma artwork and ritual; graduates are known as Chodpon (ritual master). Three years of training in Dharma music and tantric melodies; graduates are known as Bhuchen (chanting master). Two years of work to take care of the monastery; the trainees are known as Chotrimpa (Dharma security master). Three years of practice in secret tantric experiences; after this, the practitioners are given the title Tsokpen (Dharma master). If the Dzogchen Monastery finds them qualified, those who have completed all of the above training may become Dorje Lhopon (Vajra master). In the time of His Holiness the Fifth Dzogchen Rinpoche, the Mother Dzogchen Monastery was very busy with Dharma activity. In the course of one year, for the enlightenment of all sentient beings, the monastery carried out the traditional program outlined below. It has remained unchanged until today. Study and training in Dharma activities for 180 days. Training of lamas from the Dzogchen monastery's seven hundred branches in all of Tibet. All types of Drupchen (grand group practice), for 160 days, using more than 20,000 torma offerings of all different sizes, one million butter lamp offerings, and millions of pure water offerings. Sixteen days of outer, inner, and secret tantric Dharma dancing. A variety of traditional tantric Dharma music and singing rituals. Forty large sand mandala offerings. A large thangka display, celebration and large butter sculpture ceremony. 100,000 different fire pujas and three million feast ceremonies (ganachakras). An extensive display of prayer flags and the continual turning of eight large Dharma prayer wheels along with 10,000 smaller ones. Thirteen lamas making Dharmapala offerings every day of the year in the nine Gonkhungs (sacred houses). For the purpose of world peace, in a joint effort by the local people and lamas, recitation of one billion mantras for each deity. These deities are Buddha Shakyamuni, Amitabha, Avalokiteshvara, Padmasambhava, and Tara. Currently, many foreign-born reincarnations of Dzogchen monastery's Rinpoches have difficulty returning to Tibet. This leaves the Dzogchen Monastery with only ten Rinpoches from the older generation. They are His Holiness Tulku Kalsang Rinpoche, Tulku Tokdan Rinpoche, Tulku Drukpa Rinpoche, Tulku Shokli Rinpoche, and Tulku Tenpel Rinpoche. The following younger Rinpoches give guidance to the Dzogchen Monastery: Drukpa Kuchen Rinpoche, Lingla Kuchen Rinpoche, Dzogchen Khyentse Rinpoche, Tulku Kunchok Rinpoche, and Rigdzin Tharchin Rinpoche. The younger Rinpoches take care of the monastery's daily affairs. In addition to this, they direct the monastery's restoration by a crew of eight hundred young and old lamas. They are completely devoted to preserving the Dzogchen tradition. The Dzogchen monastery's largest temple has been recently rebuilt by H.E. Drukpa Kuchen Rinpoche, but many other smaller temples have not been rebuilt since 1959. Many traditional Dharma activities do not receive adequate support. As the older generation decreases in number, the wisdom of this lineage is in danger of disappearing. The traditional ceremonies and cooperative practices are the essence of monastic activity. Today only the older lamas really know the intricacies of the Dzogchen Monastery's traditional system. Every year there are fewer and fewer of the older lamas left. Of the previous 1,700 lamas of the 1950's, only about thirty remain alive. Many younger lamas who would like to stay at the monastery have great difficulty doing so. The monastery has no financial resources to support them, and the people of the Dzogchen Area are becoming poorer. The price of goods continues to increase, making it impossible for local families to lend their support. For these and many other reasons, young lamas must to leave the monastery and abandon their education. The lamas that remain have to work five times harder than previous generation of lamas. Many Tibetans are very concerned as to how the Dzogchen monastic tradition will continue. Failure to preserve the Buddhist tantric tradition of the Mother Dzogchen Monastery, the root of seven hundred branch monasteries, threatens the preservation of this ancient Dzogchen monastic system. During the last three years, our master, H. E. Dzogchen Khenpo Choga Rinpoche and Ven. 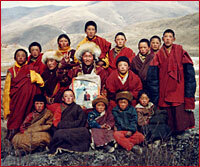 Geydrak Rinpoche have supported hundreds of young lamas of Dzogchen Monastery. We hope to continue to be able to preserve the Dzogchen lineage at this critical time by supporting more young lamas in the future. We ask that everyone help to restore the Dzogchen Monastery and help sponsor, or find sponsors for as many lamas as possible. Sponsorship for the basic necessities and education of one lama is only US $30 per month. Dzogchen Monastery in Eastern Tibet. Please visit the teaching schedule. 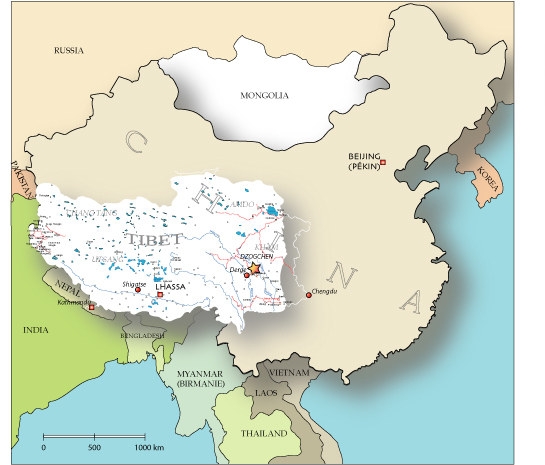 Map Showing Location of Dzogchen Area within Tibet, China.